This addon adds the /select macro command you can use instead of /use or /cast to use an item or spell among a list. Right-clicking your macro from the bars will pop out a menu where you can change the item or spell to use. Drag the macro to your bars. The first item or spell will be the default action when you hit the macro. Right-click the macro to on your bars to change it to a different item or spell. When you create that macro it will cast Battle Shout every time it's hit. If you join a group with a death knight and want to use Commanding Shout instead, right-click the macro on your bars and choose Commanding Shout. Now the macro will display and cast Commanding Shout. This is a standard focus-sheep macro. When you want to change what polymorph spell to use, right-click the macro on your bars and pick another. It will use that new polymorph until you decide to change it again. To help add items and spells to your /select macros, search:keywords are usable in place of an item or spell name. These search through your bags and spellbooks to fill the flyout with items and spells that match the keyword(s). Add an item by its item:id or all items in your bags or worn that contain the partial name. Add a spell by its numerical id or all spells that contain the partial name. Add all flying, land, favorite, favorite flying, favorite land mounts or mounts that contain the partial name. 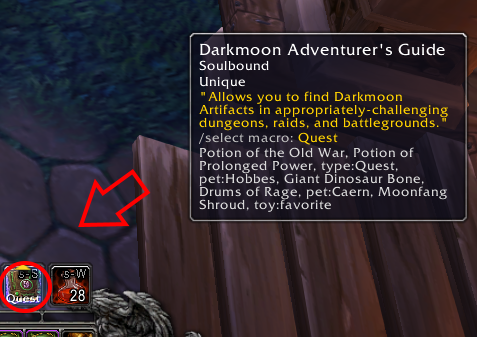 favorite-related keywords only work in WoD or if you have the Select Favorite Mounts addon in MoP. Add all items that contain the keyword in one of its type fields. See www.wowpedia.com/ItemType for a full list. Adds all primary professions, secondary professions or any professions. It will do this on its own and it will recreate this line if it's accidentally deleted or altered. You don't need to worry about it except to remember that when writing your /select macros your macro needs at least 26 characters free for it to add this line (if it's not already there). - Only the first /select in a macro will be recognized. Any others in the same macro will be ignored. - When you create or edit a macro in combat (you should be fighting!) it will wait until you leave combat to turn the macro on or make changes from your edit. - If you gain an item or spell that wasn't available as you entered combat, that item or spell won't be in the flyout until you leave combat. Q: What action bar addons does this support? A: All of them! Default too, of course. If you can drop a Blizzard macro onto the button then Select should work with that button. However, if the macros are outside the game's standard macro slots, Select won't be aware of them. Q: Can I add companion pets to /select? A: Yes and no. There's a game limitation that prevent changing the icon easily. That said, pet:name, pet:favorite and pet:any work. But be aware it uses one icon for all pets. Q: Can I change the order that items or spells list in the menu? A: If you want certain items to list before others, add them manually. ie: "/select x-51 nether-rocket x-treme, mount:flying" will list the x-51 rocket first. Q: Tyrael's Charger is missing from my land mounts! Q: Can you make the popout menu align to the action/macro button? A: No, sorry. The secure methods to get the menu working in combat prohibits anchoring willy nilly. If you have any suggestions, comments or bugs to report, feel free to post them in comments here. Thanks! Is it possible to add a mount:flying thing for aquatic mounts? Like a mount:swimming? I'll double check but I don't believe the mount API distinguishes whether a mount is aquatic. If I'm proved wrong I'll certainly add it. Yep, exactly. Thanks for your time into this. Is it possible to add support for Masque? Currently using ElvUI with Masque and the flyout displays in the default UI style. I don't know what's involved in adding Masque support. If it's anything like ElvUI it would probably be a separate module and require some guidance on what to do. I looked at the Masque wiki but I don't have time to research and experiment, sorry. New ones are created on demand in the method _Select.FillFlyout. Do you think select could interact with Opie to create some dynamic rings? What works already: I have some select macros inside Opie rings so I can change what that spot does by changing what is in the select macro (for example: I select a different flying mount on each alt using select but the flying mount is always in the some spot of the Opie ring). What would be great: If the select flyout could become a ring itself. A /type:consumable would become a ring with all consumables in the bag. It's an interesting idea. It's technically possible but since I don't think it'd have any application outside use with Opie, it'd probably be better as a separate module. Realistically I don't see it happening but I'll consider it. If an item or spell isn’t available on a character used in a Select list the button tooltip is appended with the whole list. I’ve been using a single select macro for all my hearth items and spells across all characters. Because the tooltip being appended, though, it’s making the tooltip ridiculously large. Is this the default behavior of Select, or is it possiblely another addon doing the appending? I'll see about adding an option to make it optional. Did this option ever get added? Can't seem to find a way to toggle off the list. In the next update (2.5.2) it will be in the interface options menu. This morning's update (2.4.13) dramatically improves the performance of mount keyword filters, especially for m:flying, m:land and its variations. However, it has a tradeoff that filters for m:<spellID> or m:<mountID> are less optimized. I think these individual filters may be rarely used so I'm leaving it as is for now. But if anyone uses many m:id filters and notice any issues (look for any fps drop/pause as you enter combat) let me know, I can further optimize those at the cost of more memory used. After the 7.3.5 I can't use a search in my toys tab, it always returns me to page 1. I don't know why, but it works correctly when Select is off. Thanks for the report. I can confirm this behavior. I'll take a look into this today. edit: This should be fixed in update 2.4.11 just posted. This addon seems to be causing some sort of hitching whenever I enter combat for the first time after loading into the game, or refreshing my UI, as of 7.3.5. Any insight? I'll look into it, thanks for the heads up. Unfortunately I won't have time to investigate tonight but I'll be sure to check it out tomorrow. I did a little poking around, and I think it has to do with how the addon populates flyouts when entering combat-- seems to explain why it only happens once per UI Reload. Commenting it out removed the hitch. I'm trying to figure out how to have the addon populate everything on login, as I'd prefer having a slightly longer load time at the start of my session than having a hitch when I enter combat, but there's probably a better solution that I'm unaware of in my inexperience with Lua. Edit: I have a lot of Select marcos, so this might be an edge case anyway. Yeah I'm confident you're right that it's that initial flyout creation business. I don't want to just move it all to login because you'd get a small cpu-bound hitch at login too. I'm thinking of having one flyout made every few frames on login (and then any remainder at combat start if not enough time passed) would smooth things out. Though a more ideal solution is to see if that process can be optimized better. Perhaps only creating flyouts for select macros that exist on the bars. Or only doing the bare minimum necessary before a lockdown happens so the unrestricted stuff can happen later. I'll work on the problem this weekend. The first solution (making a flyout every few frames) is pretty trivial so I feel confident I can have an update this weekend for that; but I'll tinker for a more elegant solution too.